We might only be a few weeks into the New Year, but it already is starting off with a bang. Last year and even farther back into 2015, we were calling for 2017 to be the great year for animation. A statement that still seems to be true. It is only a few weeks in and so far a lot of the new series and films we were watching from off in the distance are still that. Off in the distance but don’t fret because they are still happening! But sometimes the best things come out from midair and catch you completely surprise. A lot like Hasbro’s newest series landing on YouTube. A little something known as “Hanazuki Full of Treasures” that just made its debut today and is about to start a new chapter. To be honest, I didn’t have a clue about this at all. Somehow any word of it had fallen under the radar and with only some teaser art on the official web-site, there wasn’t much to run off. Besides cute characters designs. But thanks to the great people over at Hasbro. I was given the chance to get a first look at the adventures of Hanazuki and the world she calls her home. And let me going on record of saying – it is out of this world. And though not formally dubbed as one. I think it is more than safe to say that “Hanazuki” is another great example of a western magical girl series. Do not only take my word for it, here is the series’ official summary. As well as details about the series. The series doesn’t play off the traditional magical girl path or troupes. At times you could almost half think to lean it more towards being light science fiction fantasy. But Hanazuki does live in a world where magic is as commonplace as it comes and she does have powers of her own. Sure, she might not have her own designated magical masco or transformation sequence. But she is still a magical girl, even if it is by different meaning and criteria of the status. It’s vibrant, quirky and incredibly endearing. The world, the lore and even the characters are only at the starting line of what is sure to be interesting path filled with twist and turns along the way. With only nine of the episodes up. It is already clear that there is a lot more than meets the eye. That the bigger picture of the story is only starting to appear. And this isn’t a journey to sit out. I love that we have already seen a really good deal of the world this is set in. Started to understand how and to some degree why things are. In addition to getting to know our characters. The fact that time isn’t wasted and things are going at such a great pace that it is fantastic. Hanazuki’s existence isn’t limited to online only. Hasbro has a lot more in store for us to help fans both express and embrace our many moods. A digital app will be launching in April. Consumer products will be released throughout the year and the toy line will be showing up in select retailers in June. No details on specifics for that as of now, bit everything will be in all nationwide stores by August. With over 175 collectible treasures and figures, plush items, and so much more. So head over to Hasbro’s YouTube channel and enter the brand-new world of “Hanazuki Full of Treasures”. Again massive thank-you to Hasbro. I loved getting the chance to take a first look at this mystical new series. 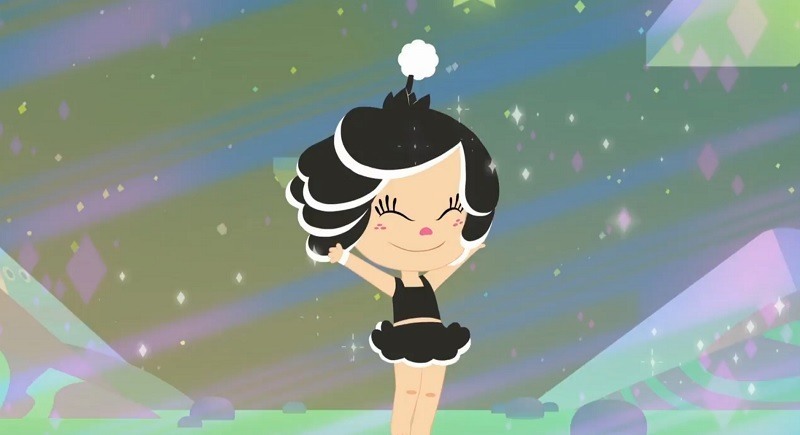 Join the conversation: What do you think of “Hanazuki Full of Adventures”? Please refrain from spoilers for your fellow readers!